Arjunganj Vidya Mandir Degree College is a self-financing co-educational institute situated in the Lucknow city of Uttar Pradesh. The Arjunganj Vidya Mandir Degree College is affiliated to Lucknow University. The College is surrounded by lush green area and has the several facilities including hostel and all other infrastructural facilities. Arjunganj Vidya Mandir Degree College provides undergraduate courses which are B.A and B.Com. The college has a very good collection of books in the library. The College also has better computer labs. RAJEEV GANDHI MEMORIAL LIBRARY is in service to facialate the students and staffs with well equipped with a vast collection of books and journals. The library subscribes all the leading newspapers and magazines. There is also a provision for the economically weaker students of the college to take books on loan from the library for the whole session. Sanskrit Saptah is celebrated for spreading sanskrit language. Lokgeet, Hindi Nibandh, Sahitiyik Antyakshari Pratiyogita is celebrated on the occasion of Hindi Diwas on 14 september. Seminar on Gandhi Jayanti is organized on 2 october. 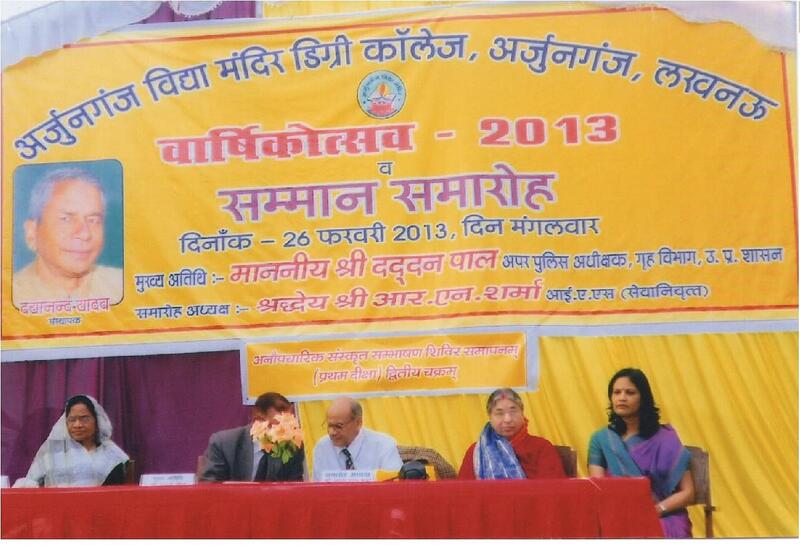 Health and awareness fair is organized on children's day on14 november. Rangoli & mehndi competition is organized on Dhanvantri Jayanti. Essay writing & Poster making competition is organized on Vivekanand Jayanti on 12 January. Annual Sports meet is organized in December - January. Annual function is celebrated in February.